When it became certain that Edward VI was dying, the duke of Northumberland, who had been ruling England in his name, made a plan that would let him hold onto his power. He dared not let Mary come to the throne because she was fiercely Catholic and he had espoused the Protestant cause. He did not want Elizabeth to rule because he knew her imperious nature would never defer to him. But there was more than one puppet master at work: The evil elf-lord Vidal Dhu had no intention of losing the flood of power the misery of Mary's reign would bring the Dark Court, and intervened so that Mary was proclaimed queen. Urged by her Chancellor and the Imperial ambassador to order Elizabeth's death, Mary chose a different to insure that Elizabeth would never reign. She must marry and bear a child to be the Catholic heir. Vidal Dhu, replete with power from the pain and terror of Mary's burning of heretics, agreed with Mary. Vidal Dhu had very special plans for that child. And since Oberon and Titania had disappeared, there now was no one except the double pair of twins to stand between the mortals of England and the rule of Evil. Mercedes Lackey is the author of the Bardic Voices series and the SERRAted Edge series (both Baen), the Heralds of Valdemar series (DAW), and many more. Of her writing, Stephen King has stated, “She’ll keep you up long past your bedtime,” and Locus raved, “Lackey is one of the best storytellers in the field.” Among her popular Baen titles are The Fire Rose, The Lark and the Wren, The Shadow of the Lion (with Eric Flint and Dave Freer) and This Scepter’d Isle, the prequel to Ill Met by Moonlight, written in collaboration with Roberta Gellis. She lives in Oklahoma. 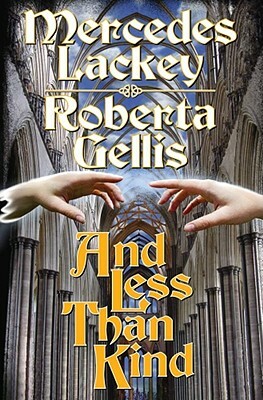 Roberta Gellis is author of over 25 novels in different fields. New York Times best-selling author John Jakes has called her “a superb storyteller of extraordinary talent,” Publishers Weekly has termed her “a master of the medieval historical,” and Romantic Times has praised her as “a master spinner of tales.” Her many awards include: The Silver and Gold Medal Porgy for historical novels from West Coast Review of Books and the Golden Certificate and Golden Pen from Affaire de Coeur. From Romantic Times she has received both the Award for Best Novel in the Medieval Period and also the Lifetime Achievement Award for Historical Fantasy. And the Romance Writers of America have presented her with their Lifetime Achievement Award.